The big chip manufacturers have been having trouble keeping slides under wraps. The latest example is a slide purporting to share performance in frames per second, as well as performance per watt, of the upcoming Radeon R9 Fury Nano. The slides come from a German tech site called Golem, using Far Cry 4 as a benchmark. If the information in the slide is to be believed, and the misspelling of “Performance” in the title means we should take them with a grain of salt, the R9 Fury Nano barely nudges out the 290X, but comes in well behind the water-cooled Fury X. 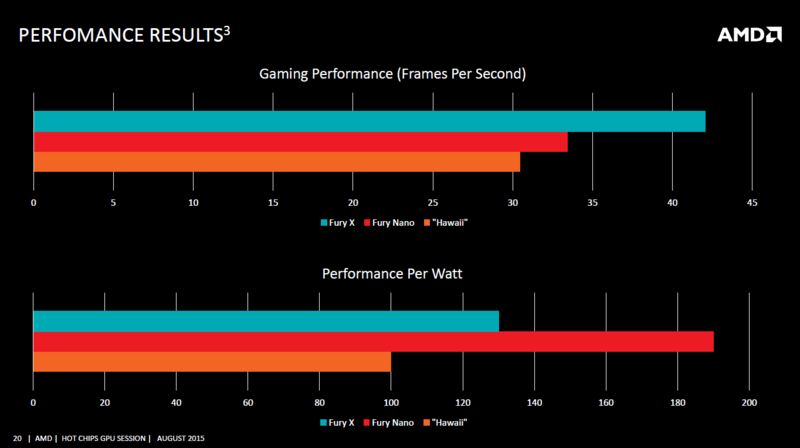 On AMD’s test system, the 290x managed just over 30 frames per second, while the Fury Nano landed around 34. The Fury X blew past both of them, averaging 42 frames per second, but what’s more impressive is the power usage. In terms of performance per watt, the graph looks quite a bit different. The Fury Nano is clearly the most power efficient of the cards, partially thanks to its 175W TDP, powered by a single 8-pin PCIe power connector. Of course, the way AMD is measuring performance per watt is by using the memory bandwidth per watt of power consumed, and that’s not a very fair fight, and the reason for that is HMB. 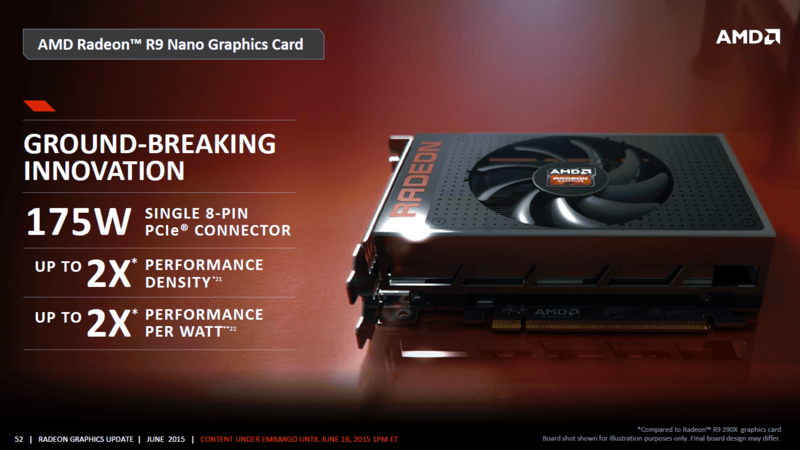 AMD’s new High Bandwidth Memory, or HBM, is a replacement for the GDDR5 memory that the 290X uses. This new memory layout stacks cells vertically, so the effective bandwidth of the memory is faster, and more power efficient, several times over. It’s still exciting to see that power usage is so much lower, but the graph is much more dramatic as a result of this newer memory architecture. Unfortunately, there’s no way of knowing yet if these slides are true, or if they are true, if they accurately reflect real world performance or power usage on the R9 Fury Nano. The newest from AMD packs some appealing features into a small package, but without real benchmarks or confirmed data, it’s a bit early to get excited.